Mount Prospect Public Library Road Trip! by Jennifer Brown Kendra thinks a road trip with her brother might be the perfect cure for his OCD and her disastrous mistake at school. At the very least she intends to reunite with their best friend Zoe, if she can find her. But will the journey free them, or make everything worse? by Susan Lucci In the humid heat of Florida, 17 year old Quentin Jacobsen takes a roadtrip with his next door neighbor, Margo, who is also the girl he has an enormous crush on. But when she runs away it’s up to Quentin to follow the clues, revealing a reality that is much different than the fantasy he’s created in his mind. by Kathy Griffin The last thing Amy wants to do after the death of her father in a car accident is drive her mother’s car across the country to help her move. And worse than that is the fact that her driving companion is a old family friend named Roger, who she definitely does not want to spend the next several days with. 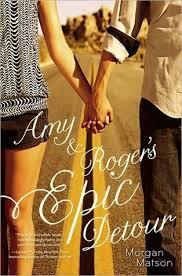 But after reconnecting with Roger, Amy finds she just might enjoy this road trip more than she was expecting – a lot more! by Ross Mathews Reagan decides the best way to heal her broken heart is to go on the road with her best friend, country rock superstar, Lilah. 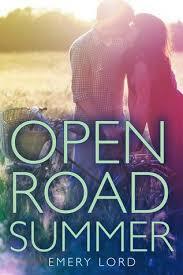 Lilah’s moving on from a bad relationship too, and both girls decide to keep the summer boy free and drama free. There may be a slight glitch in the plans however, when Reagan finds herself falling for the sweet and cute singer from the opening act. 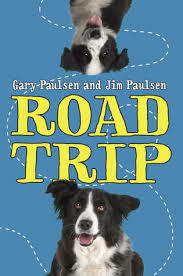 by Jim and Gary Paulsen Ben’s dad hopes their family road trip to pick up a rescue dog will bring them closer, because it seems they’ve grown apart from each other. But Ben doesn’t want to take a boring car ride with his dad, so he invites his mischievous and troublesome buddy to come with and spice things up. But none of them know what’s really in store on the open road, as they encounter a series of misadventures, additional passengers they weren’t planning on and the possibility that they are being pursued along they way. As an added bonus, every other chapter is told from the perspective of the family dog, Atticus.